In a first-pass analysis, it seems reasonable to assume that all economists have the same preferences. We all take satisfaction from the professionalism of doing our job well. Doing the job well means disagreeing openly when someone makes an assertion that seems wrong. – Paul Romer, p. 20. 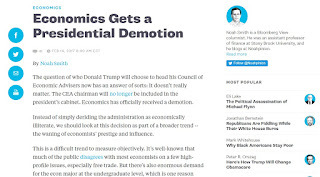 If economists fail to change their image, they run the risk that demand for their services - undergraduate education, consulting and political advice - will slowly dry up, bringing down both their salaries and their prestige. Apparently all economists care about is efficiency, but for the public jobs and security and stability and foremost equality matters more: "in a rich country, most people care more about distribution than efficiency; how the pie is divided matters crucially for most individuals’ livelihoods"
I doubt that assertion for many reasons, but let's just pretend it's true. If Noah didn't notice, equality etc is basically the only thing economists care about these days, in academic writing and lectures, in public discourse, in the media. Apparently what we teach our undergraduates isn't empirical enough – or in Noah's opinion –not containing the right answer. So we should obviously change it. If true, it'd be be a serious charge indeed. Lucky, then, that those cherry-picked stories Noah refers to aren't very representative of actual empirical studies; no, Min Wages don't help the poor, and yes, free trade is still good for consumers. 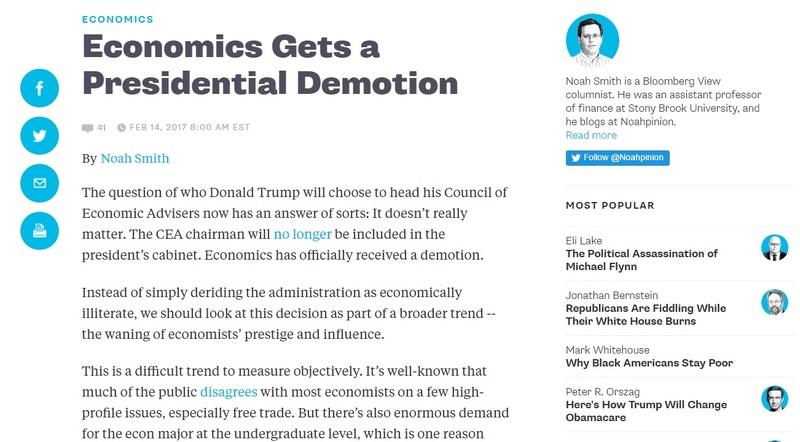 "economists should definitely never tell people that they 'flunked Econ 101.' The real world isn't a classroom, and non-economists are not students. They are smart people who want information, not a lecture." In contrast to the other points, this one might actually have some value (emphasis: some). He is right that economists are unlikely to convince anyone but a handful of dedicated students with their blackboard reasoning on say, the benefits of free trade. To reach "normal people", we have to be kinder, clearer and less condescending. On the other hand, failing econ 101 as badly as Trump or his supporters do, does deserve a fair dose of condescending comments. To invoke an oft-use analogy, nobody in a physics class would (or should) receive anything but ridicule for questioning the law of gravity. Same thing applies. Noah is probably right that people parading protectionism is an indication that what economists say, believe, prove and research carry less weight with the public – which of course may be a problem for economists seeking to influence the public. But neither of Noah's conclusions follow from that: we aren't necessarily wrong because the public distrusts or, and our methods and beliefs don't instantly have to change to incorporate that. Maybe over the longer haul, in order to ensure the survival of the discipline, but short of that, probably not.